Whilst in Santa Cruz in March, we paid a visit to the famous Plaza de los Patos (Ducks Square), in the so-called Barrio de los Hoteles (Hotels District), which is apparently the Sweetest Square in Santa Cruz. 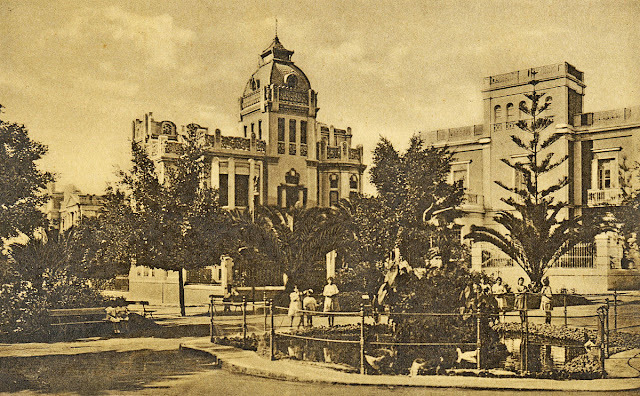 It's real name is Plaza de 25 de Julio - so named after the failed attack on Santa Cruz on that date in 1797 by Admiral Horatio Nelson. 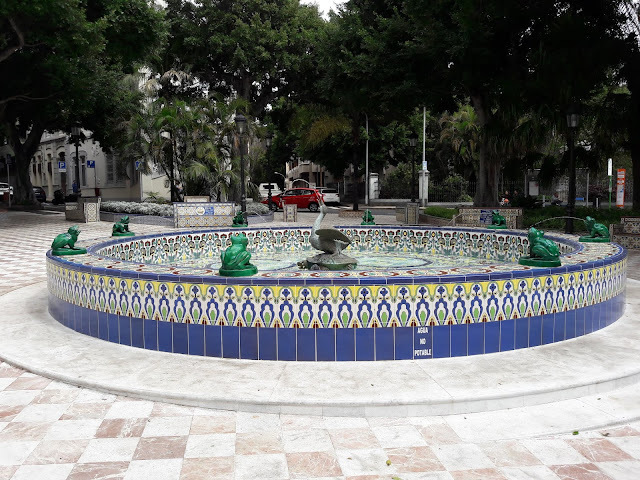 The plaza, built between 1913 and 1917, a symbol of Santa Cruz and an important part of the city's heritage, was reopened after refurbishment last year. 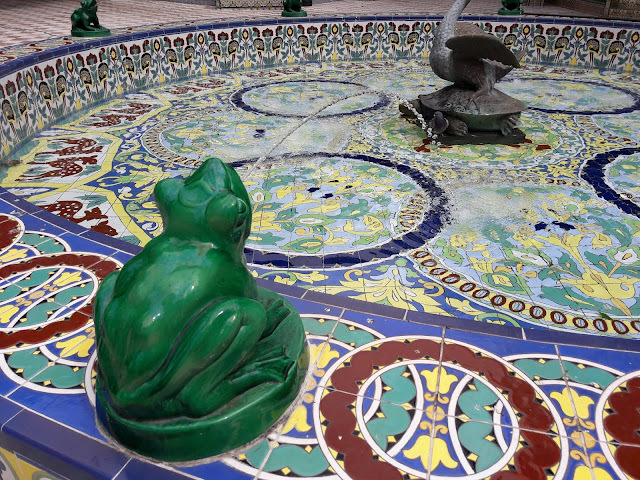 The fountain has figures of eight frogs that surround the central goose. 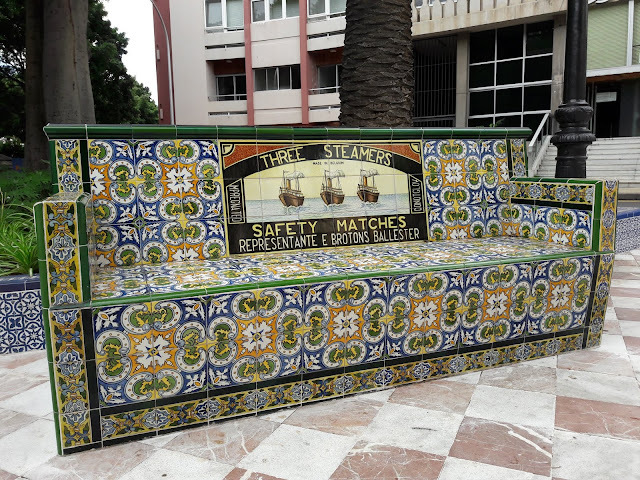 The most outstanding feature of the square, in addition to the central fountain, are the 20 benches, covered in ceramic tiles from Triana (Seville), bearing the names the companies who sponsored the construction of the Plaza. 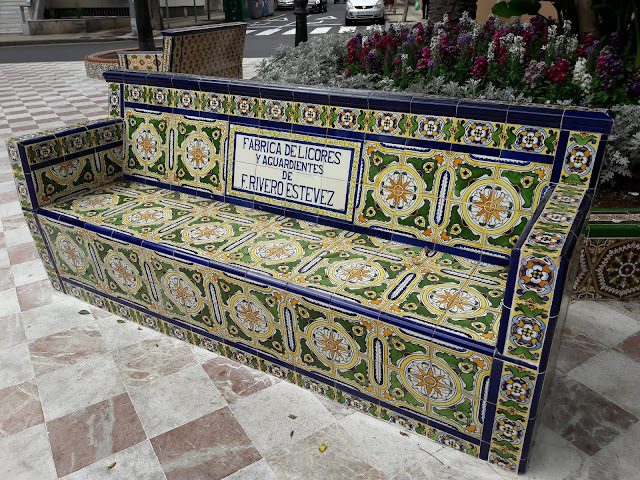 From here, it's well worth taking a stroll north on the Avenida de Veinticinco de Julio (25th July Avenue - there's a bit of a theme here - to where the avenue crosses the Rambla de Santa Cruz at the corner of the Parque García Sanabria and stop at the Kiosco Numancia. It has a reputation for being expensive (we didn't notice), but has such an interesting position right in the middle of the street where you can watch the world pass by on either side, with the tranquility of the park next to it. A perfect coffee stop in a city. 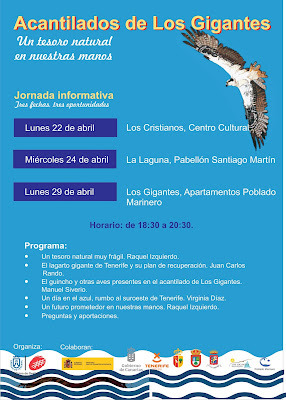 The Cabildo de Tenerife (Tenerife Island Corporation), through its Environment dept., has organised three informative talks on the environmental values ​​and the fragility of the Los Gigantes Cliffs ecosystem, one of the most visited points of the island. 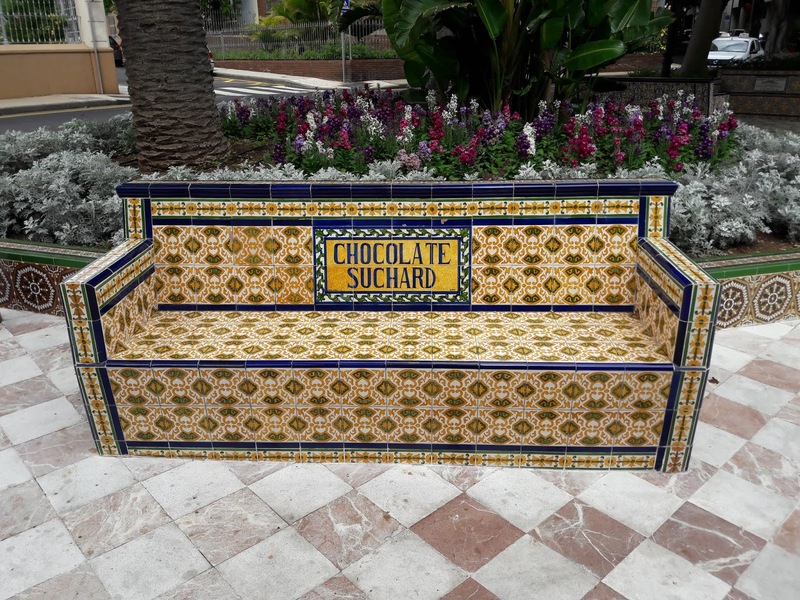 These talks are aimed mainly at tourism professionals and companies dedicated to organizing excursions and sports activities in this natural enclave of Santiago del Teide, as well as individuals and local people. The first talk will take place on April 22 at 6:30 p.m. in the Cultural Center in Los Cristianos. 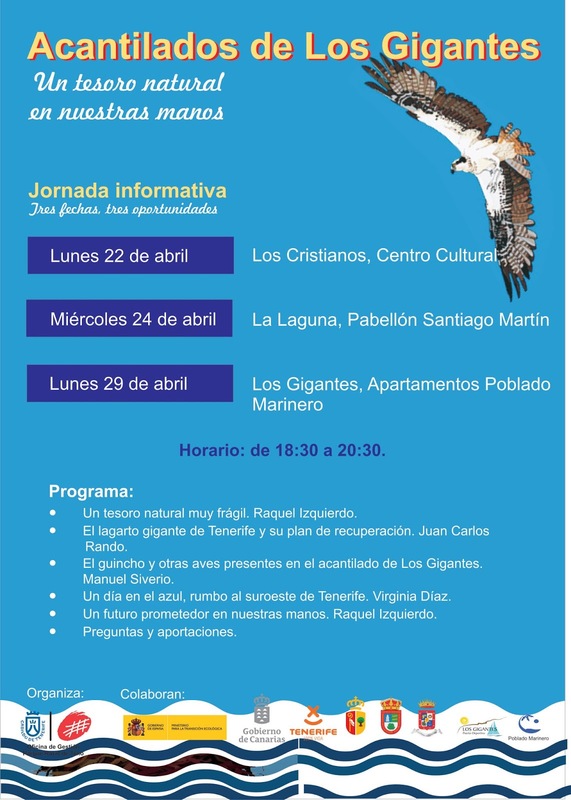 The following talk will take place on April 24, also at 6.30 pm, at the Santiago Martín Pavilion in La Laguna and the final talk is scheduled for April 29, at the same time, 6.30 pm, at the Poblado Marinero apartments in Santiago del Teide. Prior registration is not required and the talks are free (until the capacity of the rooms provided is reached). 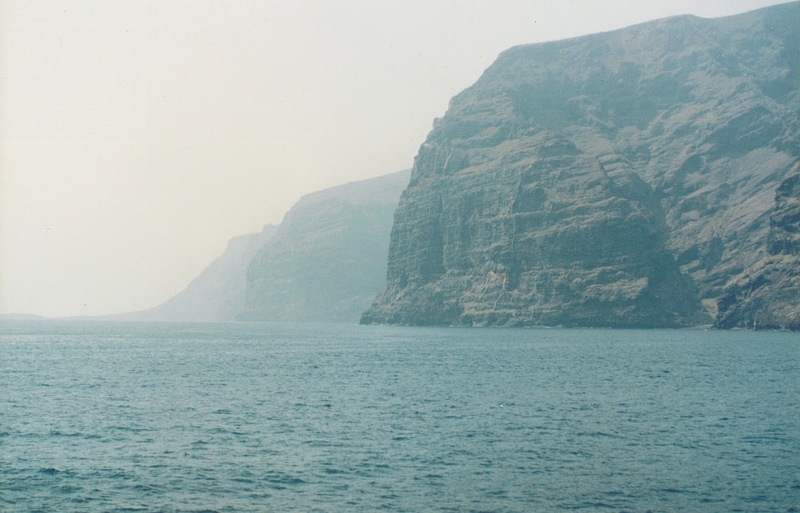 The presentations will be carried out by different environmental experts specialized in the fauna and flora that inhabit these cliffs. Special emphasis will be placed on the most fragile species, existing regulations and recommendations for their conservation. The 2nd edition of Canarias Baila - possibly the most important event of Latin urban music in the archipelago - will be held in Tenerife on April 19 at Amarilla Golf in San Miguel de Abona with Maikel DelaCalle, Justin Quiles, Cosculluela and Cazzu as headliners. 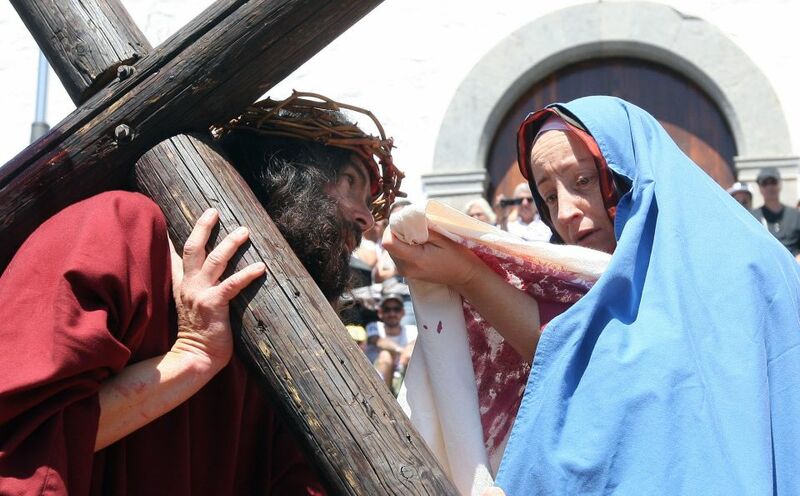 Easter Weekend, on Saturday 20 April, also sees a new edition of the GreenWorld Festival at Amarilla Golf Club de Abona, after the success of the past editions. Paco Osuna, Art Department, Marco Faraone, Martin Buttrich and Los Suruba ensure a great lineup to dance from noon until well into the night at the Papagayo Club. 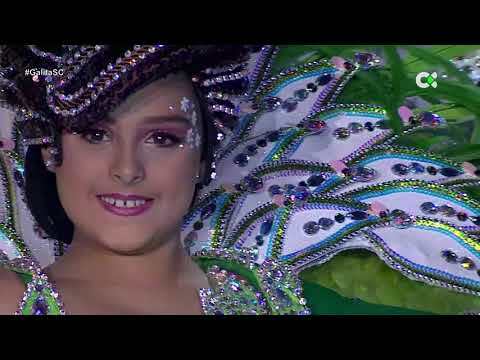 Whether looking back once more at Santa Cruz de Tenerife Carnival 2019, or forward towards Santa Cruz de Tenerife Carnival 2020 - which takes place between Friday, 21st February 2020 and Sunday, 1st March 2020 - we can't resist another look at the candidates who aspired to become carnival queens in 2019. Today we take another look at Viviane Cordobés Ramos, who was chosen as the 2nd Maid of Honour at the gala earlier this year. Her costume entitled “Mandala”, was designed by Juan Carlos Armas Febles, representing Centro Comercial Alcampo La Laguna. 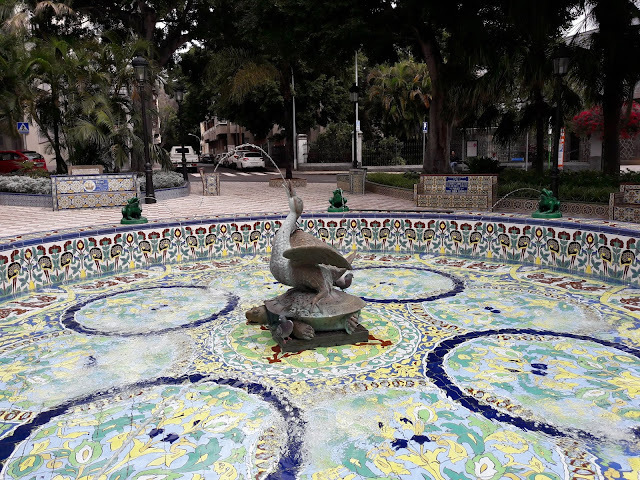 One of my favourite components of carnival, comparsas in Santa Cruz de Tenerife are said to be similar to the Brazillian Carnival Blocks, but actually appear to have more in common with the dancing, marching and drumming Samba Schools that have a strong community basis and are traditionally associated with a particular neighborhood. Los Joroperos were formed in La Laguna in 1972 and have been participating in Santa Cruz de Tenerife carnival since 1977. 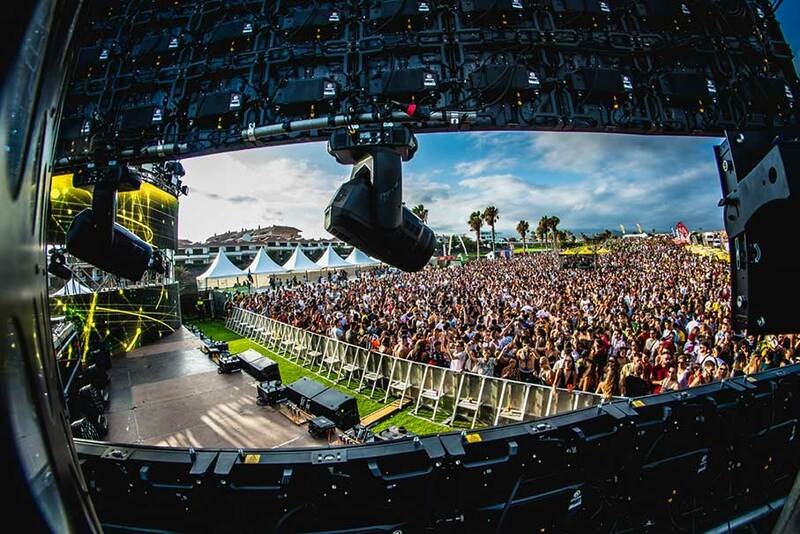 During the rest of the year, the group performs in hotels and at various fiestas, both in Tenerife and other islands of the archipelago. The most international of the comparsas, Los Joroperos have become authentic Ambassadors of Carnival, having also represented Tenerife carnival and the Canary Islands in general in numerous tourism fairs nationally and internationally, such as the International Tourism Fair in Spain (FITUR), Europalia and in Regent Street. Los Joroperos have also won the most awards, both on the islands and in many places around the world. At carnival, they've won 29 awards for interpretation, 19 for presentation and 29 in Rhythm and Harmony. In 2018, Los Joroperos were the outright winners in all of the categories at carnival in Santa Cruz de Tenerife, winning the trio of of firsts in presentation, interpretation and Rhythm and Harmony. 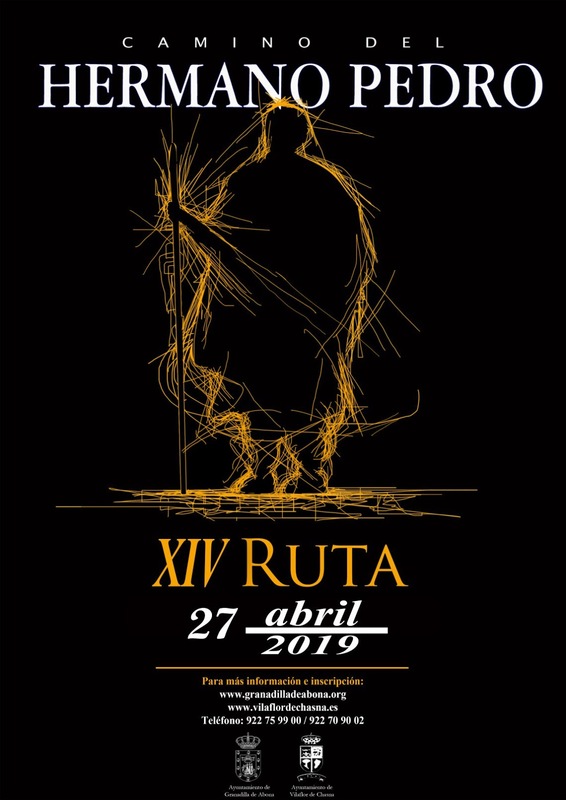 This year, they again won both presentation and interpretation at the Comparsas Contest in 2019. Fans and residents' associations feel that they deserve the recognition of a street in the city of San Cristóbal de La Laguna, where they originate, to be named after them. Find out more about Santa Cruz Carnival 2020, which will take to the streets between Friday, 21st February 2020 and Sunday, 1st March 2020. Very much worth seeing over Easter are the floral displays of the Pascua Florida, the unique and increasingly famous Easter floral festival, in the oldest central part of Guía de Isora town between Holy Thursday 18 April, and Easter Sunday 21 April 2019. 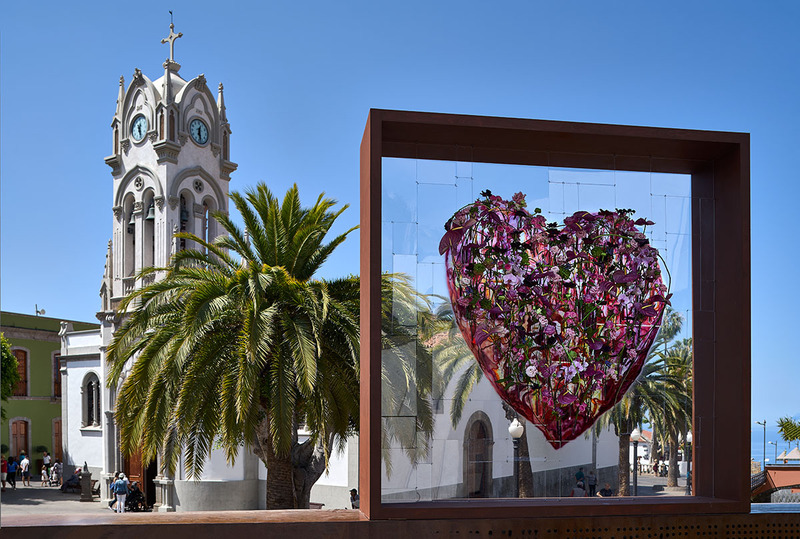 This is the 11th year that the floral festival has been held. More images here. 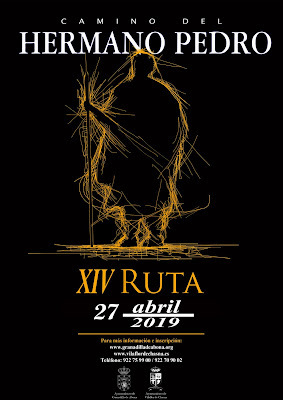 More rally action for you this weekend, on Saturday 13 April 2019, with the XV Subida Los Loros (Los Loros Hillclimb), a route above Arafo. Download this (PDF) for information on the route, access, road closures, and other important information. 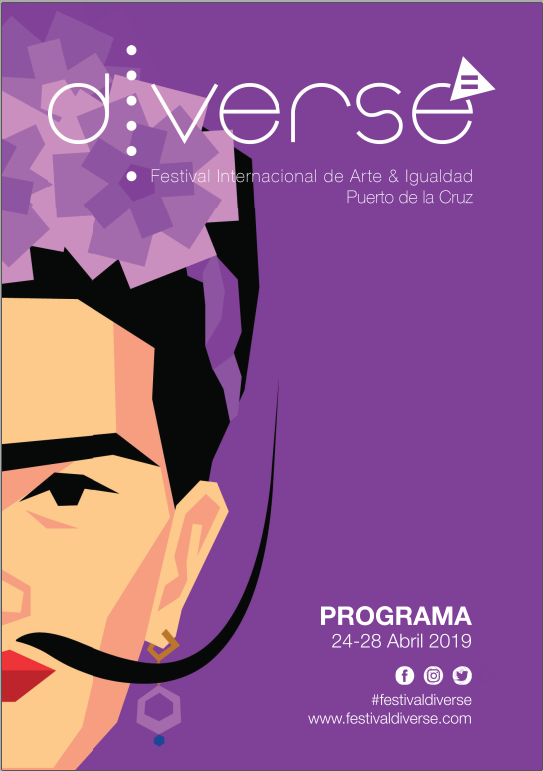 This week we look at another of the candidates for the title of Junior Carnival Queen, Aly Mesa Méndez, with a costume entitled, "ENVUÉLVEME EN CARICIAS" (Envelop me in embraces), designed by Tony Cruz and representing the Town Hall of San Juan de la Rambla, TC Diseños, Asociación Cultural Titanium and Floristería Salena.